3 March, Jakarta - The Indonesian and Dutch government today launch a comprehensive five-year multi million public-private partnership initiative for enhancing coastal safety at the North Coast of Java. 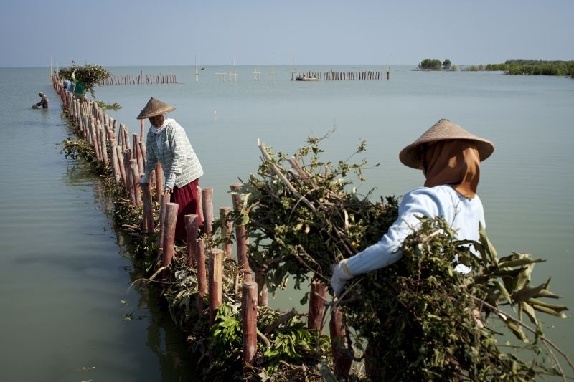 It aims to build stable coastlines with reduced erosion risk through a unique integration of mangrove restoration, small scale hard-engineering and sustainable land use. The initiative is financed by the Dutch Sustainable Water Fund and is today launched during apress conference in Jakarta by the Secretary General of the Ministry of Marine Affairs and Fisheries (MMAF), the Secretary of Central Java Province, and the Director of River and Coasts from Ministry of Public Works and Human Housing (PU) and the Dutch Ecoshape Consortium. The authorities are official partners in the initiative. The 5 million euro initiative is the leading international case of the “Building with Nature Innovation Programme”. This public-private partnership aims to stimulate sustainable coastal engineering approaches that make use of the natural protection provided by ecosystems like mangroves and salt marsh habitats. It represents the transition of traditional infrastructure designs that typically fight against nature, towards solutions that work with and alongside nature .The latter are often more cost-effective, while bringing more prosperity to the local economy such as through enhanced fisheries and carbon storage. On behalf of Ecoshape, Wetlands International coordinates the initiative in partnership with the Indonesian Government, consultancy agency Witteveen + Bos, knowledge institutes Deltares, Wageningen University & Research Centre and UNESCO-IHE, dredging companies Boskalis and Van Oord, local government and communities. Thirty million people suffer from coastal flooding and erosion hazards, affecting 3,000 villages in Northern Java. The problems largely result from the removal of mangrove belts for aquaculture development, unsustainable coastal infrastructures, and groundwater extraction. In some places more than 3 kilometers of land has already been taken by the sea and entire villages have been engulfed. Many people experience a major loss in income, reaching up to 60-80% in some villages. The agri- and aquaculture sectors, key economic engines in Indonesia, also suffer multi-billion losses. The five-year programme will focus on the most affected coastline in Demak district and is the follow-up to a successful pilot that finished in 2014. In Demak, sea level rise is projected to cause flooding 6 km inland by 2100, inundating 14,700 hectares affecting over 70,000 people and the loss of 6,000 hectares of aquaculture ponds. The partners will construct a 9 kilometer strip of permeable dams made of brush wood and 300,000 m 3sediment nourishment to trap silt, regain lost land along this eroding coast and support rehabilitation of 90 hectares of mangrove buffer. In parallel, the initiative will introduce sustainable aquaculture along the shoreline and support income diversification. This will lead to the transition from a mangrove-conversion model to a mangrove-based economic model. The aim is to inspire coastal zone managers of government and the private sector to scale up and replicate the approach in Indonesia and worldwide and to embed the approach in local and regional policies and planning. The Building with Nature approach will be promoted by Wetlands International at the Third World Conference on Disaster Risk Reduction, which will seal a post-2015 global UN Framework on Disaster Risk Reduction in the city of Sendai in Japan in March. Reducing disaster risk through nature based solutions has for the first time become a cross-cutting theme in this framework.